Let’s talk about poop. Let’s talk about all the good things and the bad things that your dog might eat. If one of those things is poop, you may be reassured to know that your dog is not alone and that scientists have recently come up with new answers about why some canine companions indulge in a treat that nauseates their humans. Researchers at the University of California surveyed 3,000 dog owners found that 16% of those pets consume feces regularly, a habit known as coprophagy. The researchers found no correlation between dogs’ age, diet or other factors. One data point did stand out, however: Dogs who ate feces preferred it to be less than two days old. Benjamin Hart, the lead author of the paper, told the Washington Post that this desire for freshness may stem from dogs’ wolf ancestors. Like dogs, wolves put a lot of distance between their dens and their bathrooms. Sick wolves, however, might not have been able to leave the den area, and their excrement may have contained parasitic eggs. Those eggs, however, would not have hatched into infectious larvae for a few days, so eating them would not make the wolves sick, and it would save the rest of the pack from illness, too. Some scientists, however, think it’s more likely that dogs who eat poop are simply doing what dogs have done for generations: Surviving on leftovers. 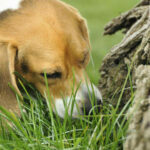 So what do scientists think pet owners whose dogs partake in this nasty habit should do? They say they are still working on that one.